she makes life outdoors a real pleasure. Unique in its size and ‘sun-lounger’ concept, the aft deck extends outdoor life to well beyond the two steering wheels. With integrated sun-loungers, it creates a space similar to a second cockpit. 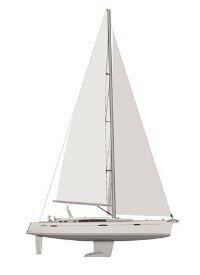 Below the deck, the swim platform closes automatically over the storage space for the tender. It takes just a few steps to reposition the Highfield tender in its ‘cabin’ equipped with an inflation/deflation system. Solid wood cockpit table - 2 fold-down flaps - fiddles - storage trays - bottle holders - 12V socket - lamp with lampshade - switch - cover. Steering stations and manoeuvring stations aft of cockpit. Ergonomic steering station with storage tray (option) drink holder, instrument panel (instruments on option).. The extension of the cockpit increase the exterior living space and creates a very convivial lounge space close to the helmsman. Upholstery dedicated to this space is available on option The storage space for the tender is located below the lounge area (tender available on option). Owner cabin with large-sized island bed. Dressing table with mirror and adjoining shelves, leather storage tray (option) and mobile seat with wedge to hold it in place under sail. Large storage volumes. Guest cabin with large double berth. Spacious guest cabin with 2 single beds that can unite to for a double bed. Sailor cabin with bunk beds on option.. Practical and ergonomic galley: 2 rectangular sink with draining board for dishes - Bin with garbage chute access - Soft-closing drawer unit. Each cabin has ensuite bathroom with separate shower. 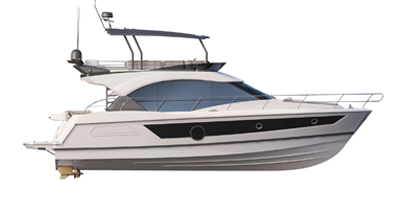 Welcoming saloon with fold-away rotating table and removable seat in the centre of the boat. Large office chart table with comfortable seat. Two symmetrical fore cabins. Clearer and easier access due to repositioning of mast, large width doors and flush flooring. Guest cabin with large double berth. Spacious guest cabin with 2 single beds that can unite to for a double bed. Sailor cabin with bunk beds on option.